Who is behind the Lo Cósmico? 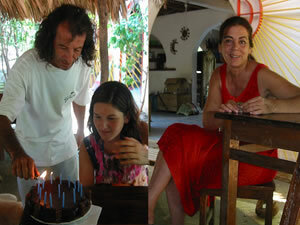 The owners are Toño and Regula, he a mexican, she a "swiss mexican" and their two daughters Natalia and Violeta. They both have been living in the Lo Cósmico together since 20 years. Responsible for this website is the Webmaster Joël Fisler. For any comments and suggestions about the website, please send an email to webmaster@locosmico.com. For everything else, use the contact form. Thanks. Upper picture: Toño, Violeta and Regula.